In Lady Be Good, married songwriters go through a series of ups and downs over the years, including divorce and remarriage. 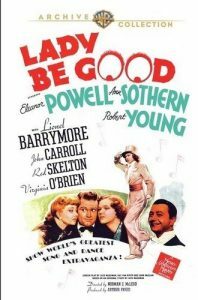 In short, Lady Be Good is the story of a romance between two song writers – who can’t live with each other, or without each other. They’re one of those couples, deeply in love, who seem to always be getting involved in a fight. They literally get together, get married, get divorced, become a songwriting sensation, get remarried … And back to divorce court. It’s a surprisingly adult look at divorce – especially in 1941. And I love the wisdom the divorce court judge dispenses on their 2nd attempt. It’s something that modern society could learn as well. ﻿ This sounds like a serious, almost depressing, description. But it’s not. It’s actually an enjoyable musical, with lots of comedy to counterbalance (thanks to Red Skelton and Virginia O’Brien). And the typical second romantic couple as well (Eleanor Powell and John Carroll, dancing and singing). It’s an enjoyable musical of the 1940’s with some interesting surprising twists. For example, Robert Young plays his character as a short-tempered, suspicious boyfriend/husband. Who causes most of his own problems. Dixie Donegan (Ann Sothern, Maisie, Panama Hattie). The lyricist of the song-writing duo. She truly loves Eddie – and isn’t above trying to make him jealous. Or trying to set unreasonable demands, such as continuing to live separately after their second marriage. Eddie Crane (Robert Young, Miracles for Sale, Marcus Welby). The young, talented, songwriter – with a temper. When jealous, he takes a punch at Buddy (for no reason) – and gets knocked down for his effort. But when all’s said and done, he has two loves: Dixie and music. Marilyn Marsh (Eleanor Powell, Ship Ahoy, I Dood It). Dixie’s roommate, and a very talented dancer in her own right. Her choreographed dance with her dog is one of the highlights of the film – seriously. Red Willet (Red Skelton, The Fuller Brush Man, Three Little Words). One of Eddie’s closest friends, who’s strictly comedy relief here. Very funny comedy relief, however. Lull (Virginia O’Brien, Meet the People, Till the Clouds Roll By). Also comedy relief, with her trademark deadpan delivery. Also very funny. Judge Murdock (Lionel Barrymore, Key Largo, You Can’t Take It With You). The very wise divorce court judge, with (separate) words of wisdom for both Dixie and Eddie. Master of Ceremonies (Phil Silvers, A Funny Thing Happened on the Way to the Forum, Sgt. Bilko). A minor appearance, almost a cameo. He is the MC at the award dinner for Eddie and Dixie. Everyone in this movie is terrific, and the story, about the humorously tempestuous relationship of a songwriting couple played by Ann Sothern and Robert Young, is one of the better ones among musicals of the period. The songs and dances are great, too, with two of the high points being Sothern’s “The Last Time I Saw Paris” and Eleanor Powell’s dancing finale. But most amazing of all is Powell’s duet with her dog. This number should be rated along with Fred Astaire’s dance on the ceiling in “Royal Wedding” and Donald O’Connor’s “Make ‘Em Laugh” as one of the best of all time. If you’re looking for social commentary, turn on NPR. If you want something deep, find a stable and pick up a shovel. This movie was meant to be fun and entertaining, and it succeeds perfectly.